This was first published in the US under the title of THE COLLABORATOR OF BETHLEHEM and that title gives a better feel for the book than THE BETHLEHEM MURDERS as the latter, to me, implies a cosier, more genteel story than it is. The UK publishers are continuing the trend by calling the next book, THE SALADIN MURDERS. 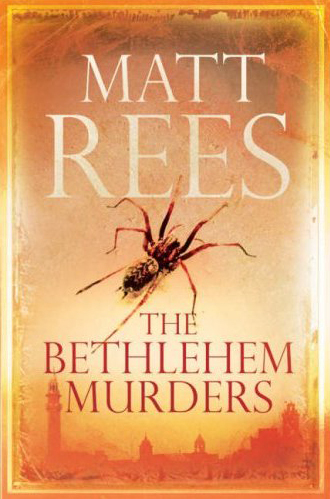 Indeed, THE BETHLEHEM MURDERS is anything but cosy and is a reflection of the grimness of life in and around Bethlehem. It's extremely sad and quite bleak, with the exception of the ray of hope in lead character, Omar Yussuf. All the crimes in this book are based on real events in Bethlehem. Though identities and some circumstances have been changed, the killers really killed this way, and those who died are dead just the same. Yussuf, is a teacher, nearing retirement age who is now teaching at the UN Girls school. Before that he used to teach at the Freres school in Bethlehem where one of his star pupils was George Saba, a Christian. George had left the country to move to Chile however homesickness brought him and his family back. Unfortunately for George, the resistance group, The Martyrs Brigade, has started to use the roof of his house to fire at the Israelis across the valley, putting George and his family in danger from retaliatory fire. One night George threatens the Martyrs Brigade and shortly after that he is arrested as a collaborator. Yussuf turns detective, as best he can, to clear his friend's name and save his life. Yussuf is an educated man with a warm heart who believes that teaching history can help. He joins the swelling ranks of cantankerous, grumpy older detectives like Morse and Montalbano however his life is very much more at risk. This story parachutes the reader into the conflict and makes it very real. I didn't find it a very uplifting book but it's certainly well worth reading so as to bring home the horror of the Middle Eastern situation.